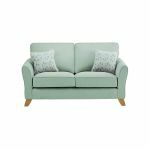 Transform your living room into a stylish retreat with the Jasmine 2 seater sofa. Boasting flared arms and luxuriously deep seat cushions, it will add instant elegance to your space. Our exclusively designed seats mean there’s no need to turn them and are supported by a durable, handcrafted frame that’s set upon solid oak feet. The comfortable seat cushions combine high-density foam with rolled carded fibre to ensure they retain their plump appearance while also looking luxurious. Gorgeous soft fabric covers offer superior quality and are perfectly contrasted by the two complementary scatter cushions. Create a coordinated look by pairing it with other matching sofas from the Jasmine range.